The Yellow Dog Café & Bar will maintain its historic presence in downtown Worden, under the direction of its new owner Nikki Schreiber-Settles. A former bartender and server at the bar, Schreiber-Settles bought the business from her best friend after working at the establishment for eight years. With expertise and support from the Illinois Metro East Small Business Development Center (SBDC) at Southern Illinois University Edwardsville, Schreiber-Settles closed on the purchase May 12. The bar has been in existence for more than 100 years. Vintage signage and photographs hanging on the bar’s walls remind patrons of what the establishment looked like way back when. Schreiber and Schreiber-Settles approached the Metro East SBDC for assistance on a number of items including how to secure financing, build their business plan and budget for both the expected and unexpected. Schreiber said SBDC Interim Director and Small Business Specialist Jo Ann DiMaggio May spent a generous amount of time with them, asking about their experience, their needs and how she could help. “Jo Ann’s expertise was practical and invaluable to us,” Schreiber said. “Her assistance caused us to think through all the aspects of buying and operating a business. Jo Ann helped identify our strengths and weaknesses, and offered expert knowledge on how to structure and complete a monthly financial report. According to DiMaggio May, the women’s work ethic and dedication to owning their own business is admirable. The Yellow Dog Café & Bar is located at 124 East Wall Street in Worden and is open daily from 6:30 a.m.-2 a.m., with the kitchen closing at 9 p.m. On Saturday nights, closing time is 3 a.m.
Music on the Patio is offered every Friday night with live musicians on the bar’s 65x40-foot patio. Mondays are also a festive time at The Yellow Dog, according to Schreiber, with 40-cent chicken wings and drink specials. The bar menu includes favorites such as the open-faced pizza burger. A men’s Bible study meets weekly and enjoys The Yellow Dog Breakfast, complete with biscuits and gravy, hash browns, toast and eggs. “We invite any groups to come and enjoy the food and use our space for their meetings,” said Schreiber. The Metro East SBDC assists existing businesses like Yellow Dog as well as new ventures headquartered in the nine-county Metro East region of Calhoun, Jersey, Madison, Bond, Clinton, St. Clair, Washington, Monroe and Randolph. It is a no-cost service to the community supported by the U.S. Small Business Administration, Illinois Department of Commerce & Economic Opportunity, and Southern Illinois University Edwardsville. Photo: Nikki Schreiber-Settles, left, and her mother Barbara Schreiber, received expertise from the Illinois Metro East Small Business Development Center. 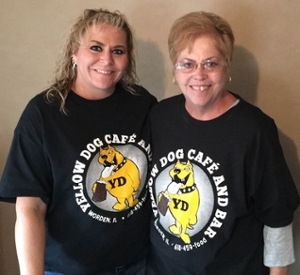 The pair recently purchased The Yellow Dog Café & Bar in downtown Worden.